This is one of the best promo from Touch Mobile that you can register for only 20 pesos good for 3 days. 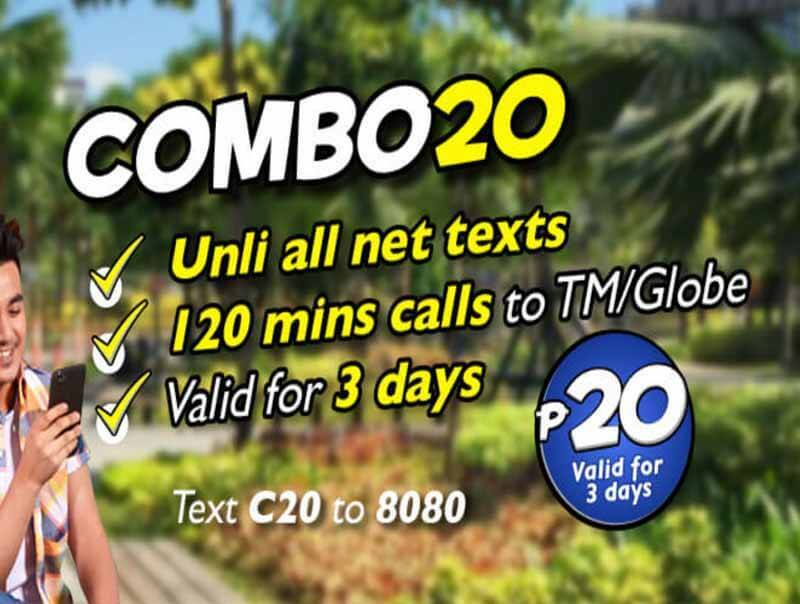 The TM C20 or COMBO20 gives you unlimited texts to all networks and 120 minutes of call to Globe and TM subscribers. You can call and texts your love ones, friends, barkada’s and classmates anytime you want when you subscribe to this promo. The good thing on about C20 promo is that you don’t need P1 maintaining balance to continue using this offer plus you can also EXTEND C20 to 24 hours before it expires for only 5 pesos. You can use the SMS keyword or dial the TM/Globe USSD code menu *143# to subscribe to this promo. Make sure you have enough load balance on your prepaid account before you text the registration code. Press 2 to call and text combo promos. Navigate and choose C20 on the list of options. If you want unlimited call and text to Globe/Touch Mobile for 3 days, just register to the TM COMBO ALL 20 promo. Tip: Wait for the SMS notification from Globe that says you are ready to use TM’s C20 promo to above unwanted load deduction.